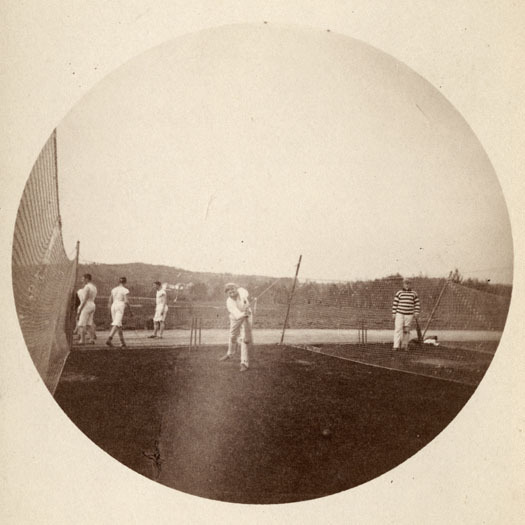 The player shown hitting the ball is identified as Samuel Wheeler Morris, Form of 1890. The other player in the striped shirt is possibly Thomas Bigelow Cowen, Form of 1891. It is possible that this photograph was taken on school grounds – a similar netted practice area existed at the Lower Grounds near the track. Verso: "Manufacturers of the Kodak Camera The Eastman Company 115 Oxford St London Rochester N. Y." printed on the back of the cabinet card. Physical Details: A Kodak No.2 type photograph mounted on a dark brown cabinet card with gold edges. "Net Practice - Morris S. W. & Cowen" written in pen on bottom edge of photograph. "Net Practice." St. Paul's School. Ohrstrom Library Digital Archives. Web. 24 Apr. 2019.